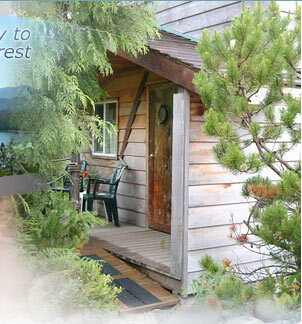 Denny Island Bed & Breakfast cabin for rent near Bella Bella, BC, Canada. Denny Island Bed and Breakfast (and cabin for rent) offers BB lodgings and a unique BC west coast retreat in the heart of the Great Bear Rainforest, home of the famous white Spirit Bear,the Kermode. Nearby Shearwater Resort & Marina offers a number of amenities including a grocery store, liquor store, post office, cappuccino bar & art gallery, restaurant and pub. Denny Island is just a short distance by water taxi from Bella Bella (known as Waglisla by First Nations) on the west coast of British Columbia. 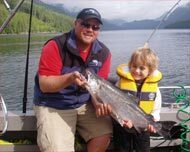 Our rental cabin accommodation on Denny Island sleeps up to 5 people and makes a wonderful home base B&B for sea kayaking tours of the central west coast of BC or exciting saltwater salmon fishing trips. All five species of wild Pacific salmon are found here and the Chinook salmon are some of the largest on the British Columbia coast. From August through to September the spawning salmon attract eagles, bears and wolves to local streams and rivers. Wildlife viewing eco tours and fishing trips can be arranged for our bed and breakfast guests. Denny Island B and B is also perfect for recreational boaters and sea kayakers who want a few days on land while taking day trips into the magnificent old growth coastal temperate rainforest. The surrounding area features secluded coves, tranquil islands, rugged coastline, protected waters and soft sandy beaches. Wildlife viewing is a popular outdoor activity with sightings of grizzly bears, black bears, the rarewhite Kermode bear, wolves and Bald Eagles. Other outdoor activities include sea kayaking, sightseeing & birding.The ocean is teeming with life including Orcas (Killer Whales), sea otters, sea lions and a marvelous variety of sea ducks and birds. This area has everything to offer those seeking a true BC wilderness experience. We invite you to experience the magic of this Canadian coastal wilderness in British Columbia. Come to Denny Island - seclusion, tranquility and the call of the wild await you! On the map, Denny Island is approximately 100 nautical miles north of Port Hardy on Vancouver Island and 76 nautical miles west of Bella Coola on the west coast of BC, Canada. Denny Island Bed & Breakfast shares the island with the Shearwater Resort & Marina and a few independent souls who love the wild beauty of the BC West Coast.